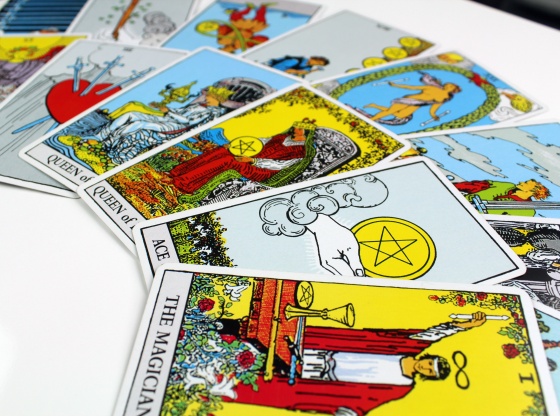 Due to the Thanksgiving holiday in the United States, the Tarot forecast this week begins on Wednesday November 24. 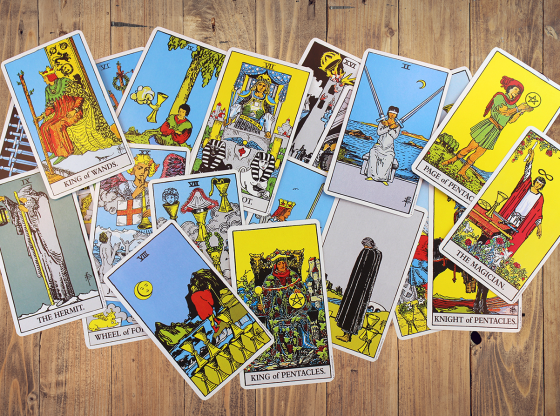 The “past” section of the reading is the week leading up to then, the “present” card we pull applies to November 24 – 27 and the future card will begin having an effect on Sunday and well into next week. 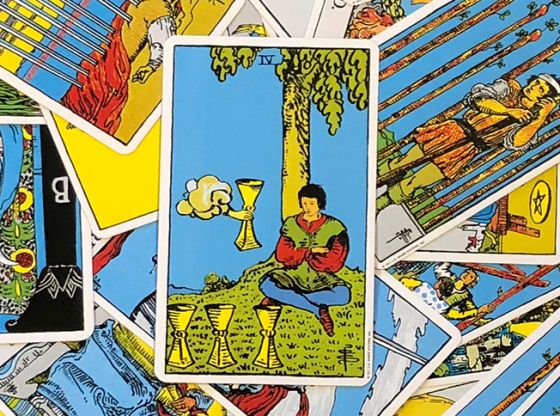 The cards in this reading are the Five of Swords in the past position, the Five of Pentacles in the present position and the Ten of Wands in the future position. 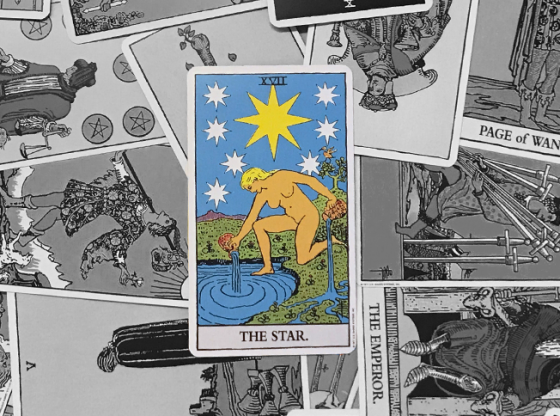 This reading is based on a foundation of actions taken in the recent past. The Five of Swords is a card that represents your actions as they now have formed what you experience as your present reality. 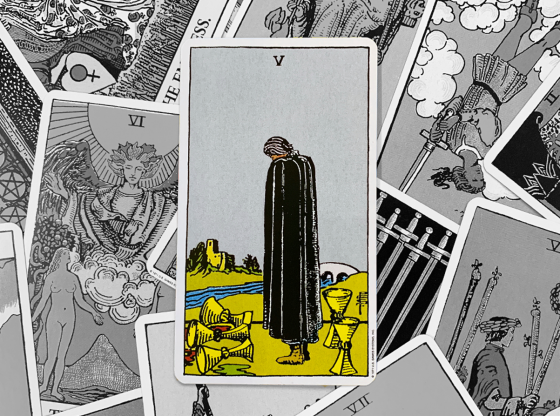 The Five of Swords reflects what might not exactly be your proudest moment. You recently got exactly what you wanted, but you might have sacrificed your standing among a group of people whose opinion matters. Think back to a situation that might have been negotiated into a win-win recently and ask yourself if your me-first attitude made it a win-lose, as you had no consideration for what the other person could have gained. The reality in which you stand right now could be the result of a situation where you took and did not give. If this does not strike you as an accurate description of your behavior last week, ask yourself if you are consorting with someone who creates ill will and if you are indirectly benefiting from it. If this person’s negative behavior benefits you in any way, the bad karma accrued may spill over and soon adversely affect your reality. 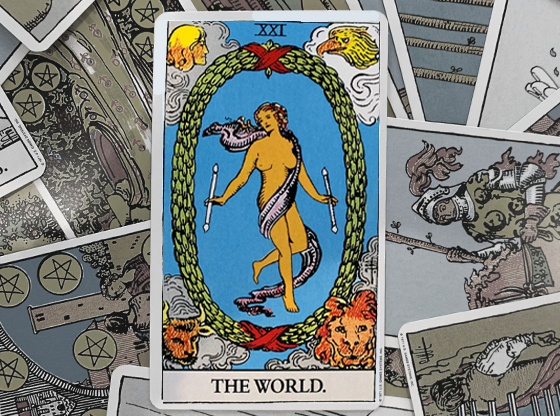 The Five of Swords card depicts a scene on a beach where a man is picking up swords that have been abandoned by others who are walking away. They have not lost the battle so much as they have lost interest in being around this person who wanted what they had. Does that sound like a metaphor for some recent interactions in your world? As the past becomes the present, the energy of such encounters is still with us. Are you feeling like you are missing out on the good times? Today, tomorrow and the beginning of this weekend may give you a sense that things sure could be better. Life is a banquet and some people are on the outside looking in. This card represents your sense of longing for something that eludes you. While you feel that it is rightfully yours, circumstance holds you back from having it. Is a lover out of the picture? Did you make a bad choice in picking where to spend your holiday? Are you stuck at work instead of with friends and family? 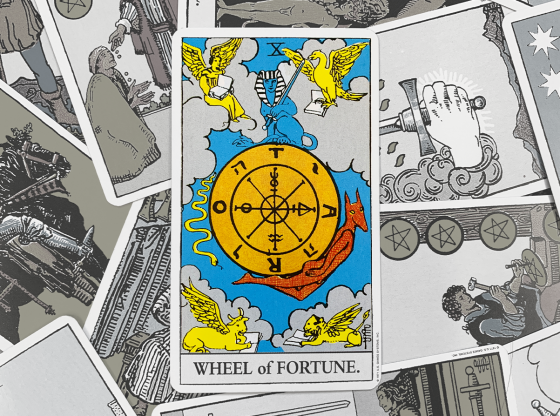 The Five of Pentacles depicts a rather gloomy scene. Two paupers trudge through the snow, one on crutches, the other appears to be barefoot. A blizzard is in high gear as they walk past a church. The stained glass window of the edifice glows from the warmth and joy inside. Five pentacles are illustrated in a pattern on this window. The Five of Pentacles describes a sense of insecurity and isolation. Perhaps your recent transgressions have left you a little cut off from people who once admired you. If your integrity has been questioned of late, you might be in an avoidant mode. If you are meeting the friends and family of a new partner for the first time over the beginning of the holiday season, you could feel like an outsider. 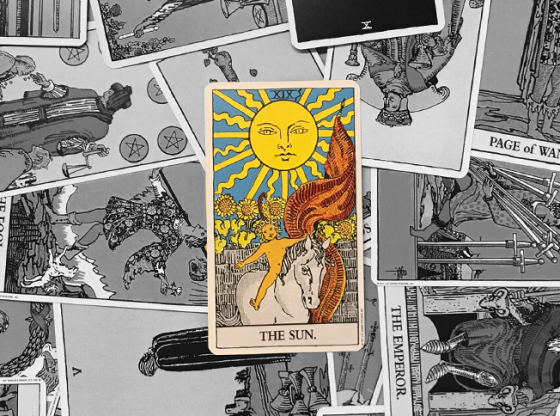 For purposes of this reading, there is a combination of a past where people were fed up with your behavior and a present where you are feeling shut out. The Five of Pentacles may be a sad card but the answer to your troubles is illustrated right in the center of it. The warm light of the brightly colored window beckons you to an interior of peace and acceptance. It hovers in the center of the card. While you feel like one of the lepers slowly decaying on a winter’s walk, concentrating on the window glowing in this scene should give you hope for the future. 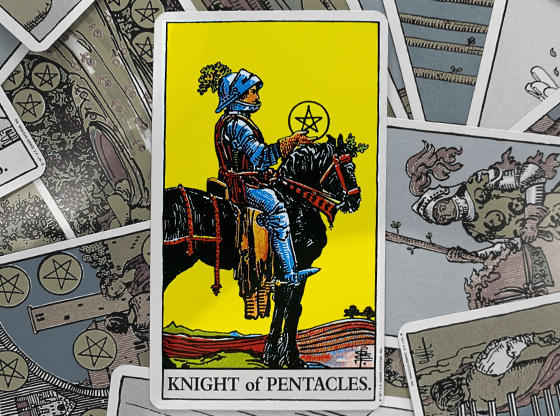 Pentacles represent material wellbeing, and to get through to the other side of that window may simply be a process of breaking a bad habit and perceiving a negative situation as a learning opportunity. Could the future look bright ahead? 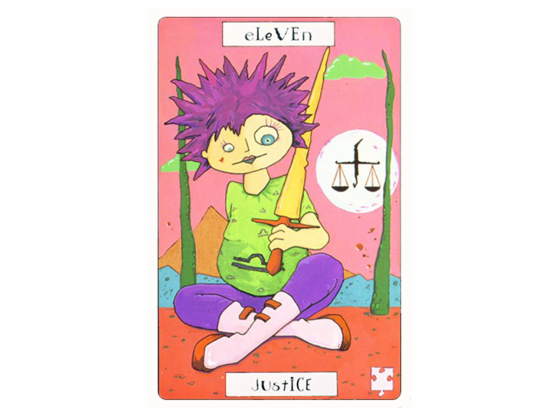 The Ten of Wands card has been drawn for the future position of this reading. This is the card of overextending yourself, carrying a load that is too heavy and walking around with just too many burdens to bear. By the end of this busy holiday weekend, you may have gained some perspective on the chaos surrounding your life. If you feel misunderstood in the present, the burden of this confusion could be something that needs to be dealt with. We are all often surrounded by so many different possibilities. This reading is telling you that you need to find one path and hone your activities to stay close to this one way of doing things. 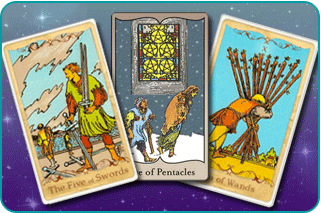 The Tarot deck’s Ten of Wands card depicts a man carrying a load of wooden walking sticks, known as Wands in Tarot lore. These represent creativity, but when there are too many possibilities, there really are no solutions. Being saddled with this many options may seem to be the opposite of the outcast couple depicted in the Five of Wands card, but their lack of any resources in a blizzard leaves them as slowed down as the man in this card who has it all – so much so that he cannot go anywhere or do anything. You will learn the most about yourself when you can measure the expectations of others. When you do not meet those expectations, the way you conduct yourself reveals your character. Breaking the bad habits that entrap you can be a most difficult process. Part of the pain of making any change is in not knowing how others will respond. But those people who love you want the best for you and hold their standards high. Making a change of a bad habit is assisted when you feel ashamed of not living up to the standards that are expected of you. As soon as early next week, you will have many options on how to get back in the good graces of the people who you most value. Now you must seize the one creative solution that can best allow you to be yourself.